Childe Hassam (1859-1935) created an immense body of work in the Impressionist style, comprising oil paintings, watercolours, pastels, and prints. His distinctive and enchanting images, with their focus on effects of colour and light, are widely admired and are included in the collections of every major museum in the United States. In this handsomely illustrated book, the authors, all experts in the field, take a fresh look at Hassam's responses to his vibrant and complicated era. Their texts study his striking portrayals of cities and country sites in America and Europe. Also explored are his late works - those completed after 1900 - when Hassam felt increasingly challenged by both modern life and modern art. These include tranquil interior vignettes, iconic images of New England churches, and his great Flag series. 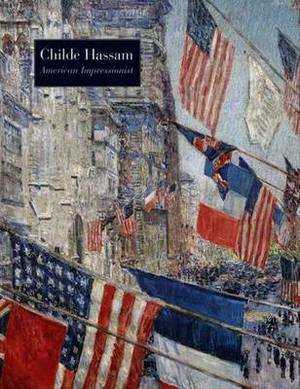 Hassam's life and career in Boston, New York, Paris, New England, and East Hampton as well as his travels are covered in fresh and insightful chapters. Essays on more specific subjects focus on Hassam's pride in his ancestry; his interest in architecture, gardens and allegorical themes; his accomplishments as a watercolourist and printmaker; his frames; the marketing of his art; and the contemporary critical response to it. The book, which also contains a chronology of Hassam's career and a comprehensive exhibition chronology, accompanies the first major museum retrospective of Hassam's works since 1972. Childe Hassam, American Impressionist examines this great artist's work in the context of his credo that the man who will go down to posterity is the man who paints his own time and the scenes of everyday life around him .